With such a diverse population in Atlanta, GA and surrounding cities, there are women and men seeking rhinoplasty (nose surgery) who want to improve the shape of their nose but still want to look natural and retain their ethnic traits. For some African Americans, they desire to enhance their inherited features while refining others in a way that balances the nose in harmony with the rest of the face. Achieving this goal is best performed by the hands of a specialist like Atlanta plastic surgeon, Dr. William E. Silver who has performed thousands of nose reshaping surgeries on all ethnic types. Rhinoplasty is perhaps the most difficult operation to perform in facial plastic surgery. One to two millimeters can be all that separates perfection from unacceptable. What may appear to be an easy change, for example increasing a low bridge, will alter the appearance of the entire nose and the way the nose interacts with the face. There is no standard ideal of what a nose should look like, and Dr. William E. Silver has found that a “Western” sense of proportion and beauty certainly does not suit every patient. He believes it is critical to tailor the nose to fit each individual patient. For African American patients, typically the shape is altered by either augmenting the nose or addressing the tip or bridge. Common characteristics of African American noses are a low bridge and a wide tip. In African Americans, reducing the size of the nose (and more specifically, the tip) too much can provide unnatural results. Usually patients opt to augment the bridge, to provide more balance to the face. Oftentimes, people of different ethnicities will have common concerns about their noses. Dr. Silver has extensive experience revising noses of all shapes and sizes, and will work with you to help you achieve your cosmetic goals. He will take the time to get to know each of his patients and will take into consideration your face as a whole to provide balance and natural results. Triple board certified plastic surgeon William E. Silver, MD, FACS, practicing in Atlanta, GA is a rhinoplasty and facial plastic surgery specialist. 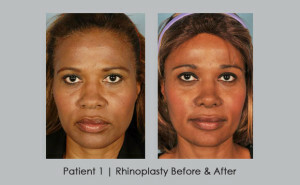 To see more examples of African American rhinoplasy click here.